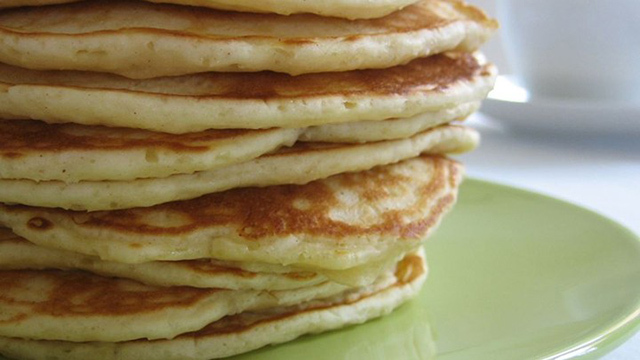 First up is an apple pancake recipe that will make breakfast or brunch (or even breakfast for dinner) extra special. While we don’t expect you to have any leftovers, if you did, they would make a great after school snack eaten cold. And if calories are a concern, look for a lighter version that is equally delicious in the tips section below the recipe. In a large bowl, combine butter, egg, milk and apple. In a separate bowl, sift together flour, baking powder, salt, cinnamon and sugar. Stir flour mixture into apple mixture, just until combined. For a less caloric version, substitute low-calorie sweetener for the sugar, 2 egg whites for the egg, 1/8 c applesauce for half of the butter, and use nonfat milk. To speed up prep time, use a food processor to grate or chop the apple, or forgo the fresh apple altogether and use applesauce instead (3oz = 1 apple). Adapted from Veronica’s Apple Pancakes found on Allrecipes.com. 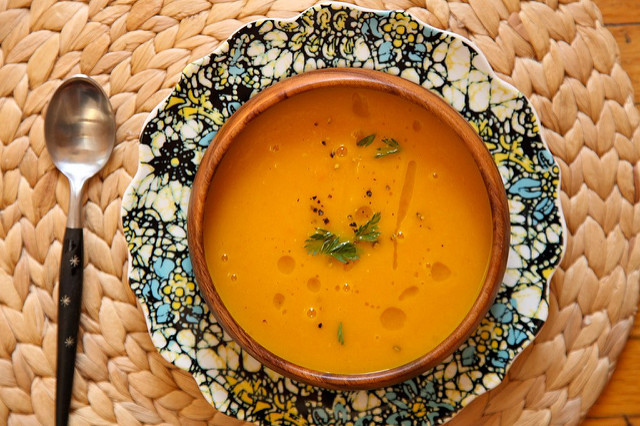 This soup looks, smells and tastes like fall! It’s truly autumn in a bowl. Serve with some good bread (though not too hard or chewy for the braces wearers) and you have a satisfying meal for Meatless Monday. Or, serve as a starter or side for a protein-based main course. Turn flame to medium-high and add vegetable broth. Bring to a boil. Reduce flame to low and simmer, uncovered, until carrots and apples are softened, about 30 minutes. Remove pan from flame and let rest for 10 minutes. Blend the soup in batches in a blender. Be sure not to fill the blender more than halfway full or hot soup will explode everywhere. Also, when blending hot liquids in a blender, leave the blender lid slightly ajar to let some of the steam escape. Once all of the soup is blended, return to pot. Add a dash of fresh ground nutmeg, as well as salt and pepper to taste. The soup won’t need much pepper, as ginger is pretty spicy. Serve with a drizzle of quality olive oil. For a thinner soup, add more vegetable broth. For a creamier soup, try adding some half and half. Soup will keep in the fridge for four days in an air-tight container. It can also be frozen, just thaw in the fridge before reheating. Our final fall recipe for today is another vegetarian number that can hold its own as a main dish or be paired with a protein for a heartier meal. We’ve also shared instructions in the tips section for a bacon version, but again use caution if there are metal braces-wearers in your household, as tough meats can potentially loosen the brackets and wires of braces. 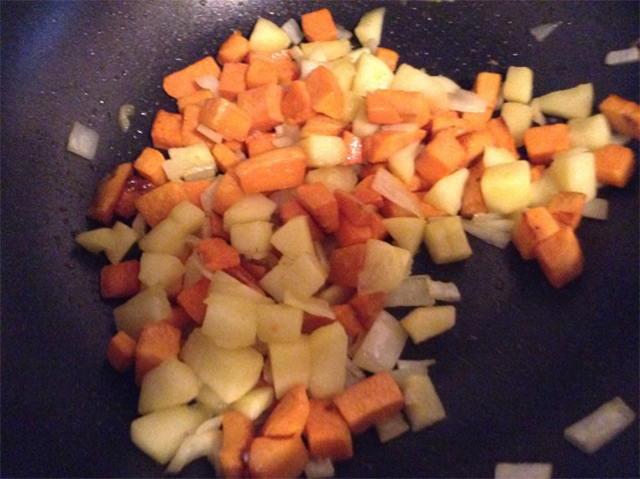 In a bowl toss sweet potatoes with olive oil (enough to thoroughly coat). Arrange in a single layer on a baking sheet and roast for 10 minutes or until they’re just tender but not over-cooked. Coat a skillet with olive oil (just enough to cover the bottom), add onion and apples and sprinkle with salt. Cook over medium heat until the apples start to become tender, stirring occasionally (about 4-5min). Add sweet potatoes and cook a few minutes longer to let everything get cooked through and let all those fall flavors come together! Remove from heat and serve. For a little more zing, add a pinch of crushed red pepper or hot sauce to taste. Could also stir in some maple syrup for added flavor. For bacon version, cook four thick strips of bacon cut into smaller pieces in the pan before adding the rest of the ingredients. Original recipe posted by thesinglebite on food.com. Have you tried any of these recipes? If so, let us know what you thought in the comments. And for even more braces friendly recipes, visit our blog.